As a busy society with 24/7 access to news, articles, photos and videos, many people don't always have the time or interest to read copy-heavy advertisements. Social media, cell phones and YouTube have all brought on a wave of video-focused consumption. 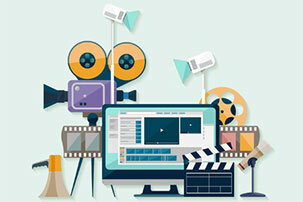 By leveraging animated video marketing, businesses can educate, inform and showcase their services through brief, engaging video content and graphics. Since we are affiliated with a professional video company, we can help you every step of the way to create a script, adjust your storyline, along with visual and sound effects. Once your video is approved and ready to go, it can live anywhere you want such as YouTube, website, social media, etc., after all…it's all yours! The goal with Animated Video Marketing is to grab the attention of your viewer within the first 10 seconds. 80% of viewers will only watch a video for 0-30 seconds. Go over the minute mark and only 65% of viewers will stay with you.